DEW Wildlife Sanctuary & Happy New Year ! I wanted to take a moment to wish everyone a Healthy and Happy New Year and reflect a little on 2011. Sadly my husbands father died of cancer this past June. Carl Sr. found out he had cancer just before my father did in 2010. My father decided not to fight his cancer as it was too far advanced and passed away in October. My father in-law on the other hand, did fight it but sadly did not have the quality of life we would have wished for him during his 10 month long courageous fight. Just yesterday, I finished scanning and storing nearly 100 old photos of my husbands family to a new 7" digital slide show frame that I had purchased for my husband for Christmas. Now he can view his favorite family photo's, some of them taken before he was born and some dated as far back as 1933. It is amazing how time flies. You know the old saying: "Every day should be lived like it was your last". Well, it is so true and should be followed by us all. Many of us have to go through a loss of a loved one or recover from a near death illness to learn this valuable lesson. Please take my advise and take the time to smell the roses each day and enjoy life to its fullest because you just do not know when it will be your last. On a lighter note I wanted to let you know that I finally was able to visit Maine's best-kept secret the "DEW wildlife Sanctuary" last fall located in MT. Vernon, Maine. (DEW stands for Domestic, Exotic Wildlife). And they also maintain an Animal Rehabilitation Permit issued by the State of Maine to rehabilitate injured, orphaned or sick animals indigenous to Maine and release them back into the wild. This Animal Kingdom is run by Julie and Bob Miner and is a truly wonderful treasure of Maine. I was not aware of this sanctuary until the Sun & Journal did a local story last year. 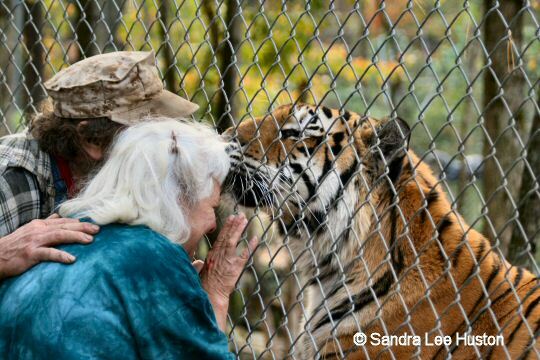 Than a friend of mine had the pleasure of visiting them in June and said how much she enjoyed viewing all the animals especially the baby white Tiger. After I mentioned to my husband that I would also love to visit them he decided to surprise me by taking me there in October. It was a truly wonderful experience and the best birthday present ever. 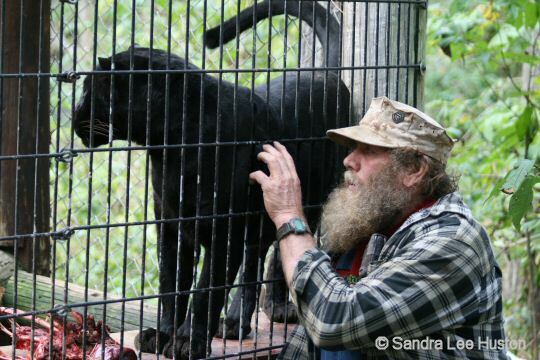 As we caught up to Bob Miner and the group he was taking on tour, he noticed how fascinated I was with his Big Cats. He came up to me and pulled me by the arm and brought me and another lady inside the first enclosure of the big cats cages so that I could take more up close and personal shots of these regal cats. I was even allowed to brush my hand against the cage as he called to them and feel the fur of one of the Tigers and a Black Leopard named Bejoux. It was an amazing experience to be so close to these wonderful cats and will be one of my most treasured memories. One of the photographs I captured was of Tundra a male Lion with the sun dappled on his face as he lay beside his mate. As a special thank you to Bob for allowing me such a great privilege. I have decided to paint a pastel portrait of Tundra using this photograph as reference and donate the proceeds of the sale of this painting towards the care of all the animals housed at DEW. 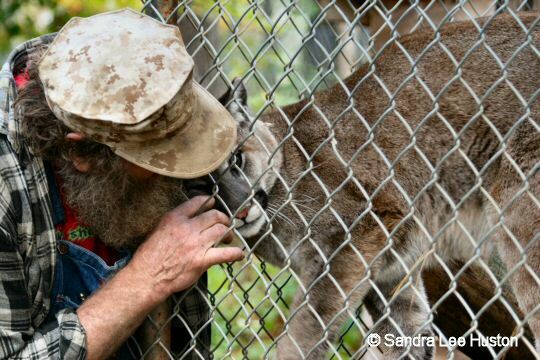 See below for some of the shots I captured of Bob Miner and his beloved great cats as he greeted them and see for yourselves the love these animals have for him. For those of you who would like to learn more about the sanctuary you can visit www.dewanimalkingdom.com and if you are ever in the area take the time to visit you will be happy you did. Love Generously, Speak Truthfully and leave the rest to God.